Black is the Color of My Voice tickets are now available. This moving journey through the life of a jazz singer and activist comes to London’s Trafalgar Studios 2. 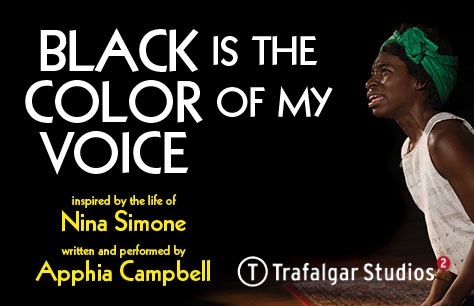 Following sell-out performances around the world and at London’s own Wilton’s Music Hall, Apphia Campbell brings her stunning show Black Is The Color Of My Voice to Trafalgar Studios 2. Inspired by the incredible life of Nina Simone, Black Is The Color of My Voice follows the life of a young piano prodigy with strong ties to the church on her journey to become a successful jazz singer and civil rights activist. Watch as this incredible singer and figure at the forefront of the Civil Rights Movement looks for peace after the unexpected death of her father. After select performances, Apphia Campbell will perform Soul Sessions, her cabaret tribute to the music of Nina Simone. Additional information and Soul Session tickets for these performances are available here. Tickets for Black Is The Color Of My Voice are now available for this limited run at Trafalgar Studios 2.